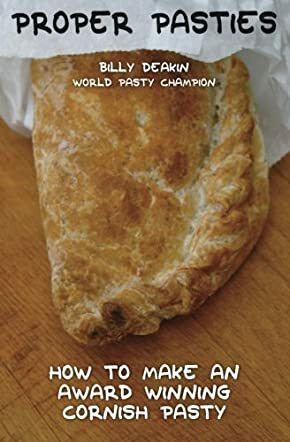 Proper Pasties is written by an award winning pasty baker, Billy Deakin, who won the title of Amateur Cornish Pasty World Champion in 2012. This achievement sets the tone of the book as the author not only knows the inside out of baking a proper Cornish pasty, but he also shares the award winning recipe for anyone who wants to give it a try. The book carries the reader through the history of the Cornish pasty, which was the miner’s food and covered the caloric intake for the day, through the legal aspect of the Cornish pasty specifications and how this affected small business owners in Cornwall; as well as through the World Pasty Championship. The book finishes with various recipes that can be made at home: steak and blue, chili beef, lamb and mint, spiced oxtail and sweet potato among others. Everyone who can follow a recipe and can measure correctly can make a pasty, says Deakin in his book Proper Pasties. The book is clearly written for a wide audience and, apart from the recipes, it contains useful information about Cornwall and the history of the pasty. The author also talks about similar dishes in other countries. The book is informative and enjoyable and it is a great recipe book to have in any household. The photos and illustrations throughout the book make it easy to imagine what the dish looks like, especially for those who are not familiar with pasties. As for me, since I live in the UK and visit Cornwall quite often, I finally understood what makes a pasty “Cornish.” Now, I can’t wait to try one or two recipes from the book.